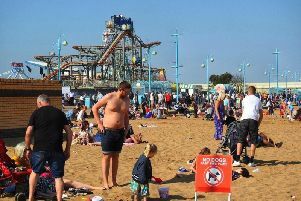 Councillors have failed to make a decision over whether to sell the Pier Field seafront site in Skegness. East Lindsey District Council has tonight (Wednesday) decided to hold a further meeting on whether to sell the seafront site - A SALE WHICH could pave the way for a Premier Inn and KFC restaurant. The decision on whether to sell the site was initially delayed and moved to the full council meeting following the submission of a 5,000 signature petition - with 2,500 said to be from East Lindsey. Campaigners are calling for the council not to sell the site to KCS Developments and that it be designated as an asset of community value under the Local Act. * The decision on the Asset of Community Value. Developers hope to build an 80-bed hotel, drive-through restaurant and approximately 158 car parking spaces- subject to planning permission. Back in January, Premier Inn acquisitions manager Kevin Murray said: “Premier Inn is committed to investing in Skegness. “We are currently drawing up our plans for a new hotel on the Pier Field site. If approved, the new Premier Inn would bring up to 50 new jobs and £6.4 million of investment to the local area.